Susan Washington Morrison Avery died on March 24, 1886, leaving Alphonso Calhoun Avery with six of the couple's eight children: Mary Graham (1862-1863), Harriet Eloise (b. 1864), Morrison Robert (1868-1890), Anna Julia (1869-1871), Isaac Erwin (1871-1904), Susan Washington (b. 1873), Alphonso Calhoun (b. 1874), and Alfred Lee (b. 1876). 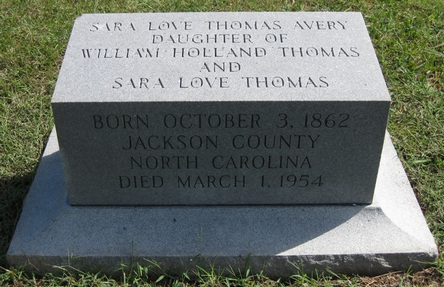 On 31 December 1888, Avery married Sallie Love Thomas (1862-1954), the daughter of Cherokee Chief and Colonel William Holland Thomas and Sarah Jane Burney Love Thomas of North Carolina. Alphonso and Sallie had three children: Lenoir Thomas (b. 1889), Gladys Love (1892-1984), and Edith Calvert (b. 1894). Alphonso Calhoun Avery of Burke County, North Carolina, was a lawyer, judge in the North Carolina Superior Courts, North Carolina Supreme Court justice, and a major in the 6th North Carolina Regiment during the Civil War. He married Susan Washington Morrison in 1861 and Sallie Love Thomas in 1888. He had eleven children, including Isaac Erwin Avery and Gladys Avery Tillett. Alphonso Calhoun Avery (1835-1913), the fifth son of Isaac Thomas Avery and Harriet Erwin Avery, was born at Swan Ponds in Burke County, N.C., on September 11, 1835. He attended the Bingham School in Oaks, Orange County, N.C., and was graduated from the University of North Carolina in 1857. After two years spent overseeing one of his father's farms in Mitchell County, Avery studied law under Richmond Pearson and obtained his license to practice in the county courts in June 1860. On February 27, 1861, Avery married Susan Washington Morrison (1838-1886), daughter of the Reverend R. H. Morrison of Lincoln County, N.C. In May 1861, Avery was commissioned a first lieutenant in Company F of the 6th North Carolina Regiment, which was commanded by his brother, Colonel Isaac Erwin Avery (1828-1863). Avery saw action at the Battle of Manassas and was promoted to captain after the Battle of Seven Pines. In December 1862, Avery was transferred to the staff of his brother-in-law, General D. H. Hill, where he was promoted to major. In 1864, Avery went with Hill to the Army of the West and then served on the staffs of generals John C. Breckinridge, Thomas C. Hindman, and John B. Hood. In the summer of 1864, Avery received a leave of absence to return home, due to his father's illness and the battle-related deaths of his three older brothers. He was then transferred to the Department of North Carolina and formed a regiment to protect the state's western frontier. Avery was captured by Union troops in the spring of 1865 and imprisoned at Camp Chase in Tennessee until he was paroled in August 1865. After the war, Avery returned home to Swan Ponds, began practicing law in Morganton, and obtained his license to practice before the North Carolina Supreme Court. In 1866, he was elected to represent Burke, Caldwell, and McDowell counties in the North Carolina Senate, where he served as chair of the Committee on Internal Improvements. Avery was also a contractor for the Western North Carolina Railroad. He lost his political office in 1867 when the Republican Party gained control of state government, and he became a member of the Ku Klux Klan in western North Carolina. In 1875, Avery was elected as a delegate to the North Carolina Constitutional Convention, and, in 1876, he was a Democratic Presidential Elector. In 1876, Avery and his family moved to Morganton, which was more convenient for his legal work, and the estate at Swan Ponds was divided among his father's heirs. Following the return of the Democrats to power in 1878, Avery was elected to serve as a judge in the North Carolina Superior Court. He filed over 500 opinions; those of note deal with the homestead, boundaries, fraud, and insurance. In that same year, he became a member of the First Presbyterian Church in Morganton, and was ordained a ruling elder in 1879. 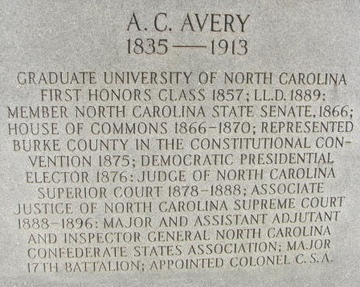 After serving as a Superior Court judge for ten years, Avery was elected to the North Carolina Supreme Court in 1888. In 1892, Avery also acted as the dean of the law school at Trinity College. 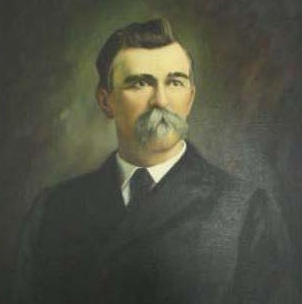 Following his retirement from the Supreme Court in 1897, Avery resumed his private law practice and taught law classes in Morganton. In addition to his legal work, Avery also wrote prolifically on legal topics, the Civil War, and western North Carolina history. After struggling with diabetes, Alphonso Calhoun Avery died in Morganton on 13 June 1913. Recommended Reading: Touring the Western North Carolina Backroads (Touring the Backroads). Editorial Review: This guidebook, unlike most, is so encyclopedic in scope that I give it as a gift to newcomers to the area. It is also an invaluable reference for the visitor who wants to see more than the fabulous Biltmore Estate. Even though I am a native of the area, I learned nearly everything I know about Western North Carolina from this book alone and it is my primary reference. I am still amazed at how much fact, history and folklore [just enough to bring alive the curve of the road, the odd landmark, the abandoned building] is packed in its 300 pages. The author, who must have collapsed from exhaustion when she finished it, takes you on a detailed tour, laid out by the tenth of the mile, of carefully drawn sections of backroads that you can follow leisurely without getting lost. Continued below. Sources: Inventory of the Alphonso Calhoun Avery Papers (1761-1977), Collection Number 3456, Manuscripts Department, CB#3926, Wilson Library, University of North Carolina at Chapel Hill.